Thanks to the power of Pinterest, I discovered a blog that not only is well written, but has really interesting content that makes me want to do some genealogy writing to help tell the story of my loved ones. She set goals for herself and her research and then updated them along the way. She’s partaken in some fun activities like the Genealogy A to Z which I find fascinating and am tempted to try myself. From what I understand you dedicate 26 posts to each of the letters of the alphabet in order and how it relates to your research. This can be first names, last names and locations. I think I’d feel better if I had a specific “Z” name/place and then I’d get cracking. With how large my tree is I think I could probably cover every other letter in the alphabet. Of course it was a specific challenge that she had found from another website: http://www.gouldgenealogy.com. What I find really interesting about What’s Past is Prologue, is that the author has really needed to branch out and use some tools that I have been really lucky to not need, namely a translator for documents. My family is English, Scottish and Irish. Before coming to North America we were pretty much centered around the British Isles. They spoke English. They didn’t move around much and frankly it’s amazing that they moved to Canada or the US at all. Seriously though, her pictures she posts are entertaining, the writing is smooth and flows well and it has all those little nuances that makes family history interesting and fun. I love that she not only focuses on the hard data, the names, the birthdays, the weddings, but she has information about their lives. She’s included memories and family stories and it’s really quite fascinating. It’s true I have been going with all guns blazing to get together as much information as possible about my family for our reunions coming this year. But have I really actually thought about writing about the people on my tree and what makes them so unique and special to me? A little bit. Have I done it? Not yet. I’m hoping that in 2013/2014 I can rectify this situation and do much better and sharing some of the awesome information that I’ve found out about my family. In closing, I leave you with a picture I was able to capture when visiting with my Great Aunt Margaret. 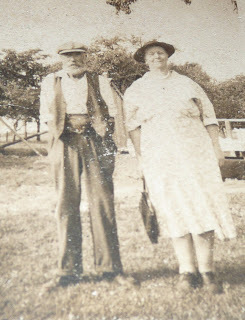 This is my great grandparents: Charles Edmunds Hill and Ada Elizabeth Woolger on their farm outside of Guelph, Ontario. The resemblance of my recently departed Aunt Jessie and Ada is remarkable.